Enfield’s Trent Park has a remarkable place in our history. Once home to the Bevan and Sassoon families, it was at the centre of some of the most defining moments of the 20th Century. During the Second World War it took on a top-secret role that would not be revealed for nearly 70 years. 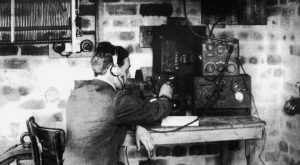 Last year, Historic England formally concluded that Trent Park’s wartime work was “of considerable national and international historical interest which bears comparison to the code-breaking work at Bletchley Park”. luxury and comfort, and made to feel at ease. What the generals did not know was that the stately home was being bugged – and the private conversations of these top-ranking Nazis were being recorded by a team of ‘Secret Listeners’. The Secret Listeners were German-Jewish refugees, who had themselves escaped from Nazi persecution. The information they uncovered included details of Hitler’s deadly weapons programme, new technology on German aircraft (the discovery of which helped the RAF win the Battle of Britain in 1940), enemy battle plans, and evidence of war crimes. Such crucial information provided intelligence that made a difference to the outcome of the war. This unique history will be brought to life through the creation of a new national ‘living’ museum at Trent Park, due to open to the public in 2021. Its rooms will showcase the mansion as it was during the pre-war era, against which its stories will be told via audio-visual and immersive technology to bring to life the secret wartime surveillance operation. Recognising its importance, the new site owner, developer Berkeley Homes, is supporting and working closely with Trent Park Museum Trust to realise the vision. At its heart will be an important education programme for schools. Please help to preserve and share the stories of Trent Park’s history and consider a donation towards the vital fundraising programme.